The water heater is one of the most important items in your home. Unfortunately, most homeowners don’t realize the importance of keeping their system clean. The easiest way to extend the life of your water heater is with routine maintenance. Yearly maintenance on your water heater ensures safe and proper performance to avoid future problems or water heater replacement. According to most water heater manufacturers, maintenance of your water heater is required to keep your manufacturer’s warranty valid. 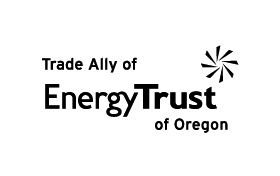 Therefore, it is highly recommended that water heater tanks are drained and flushed free of sediment every 12 months to bring your water heater back to the original manufacturer’s specifications. Highly corrosive sediment can build up in your water heater tank. This sediment can interfere with critical water heater components, and damage or destroy the system. Failure to properly maintain your water heater can result in the corrosion of the anode rod, the most important part of the water heater. Pictured above is a new anode rod compared to an old anode rod. If not replaced in a timely manner, this rod can cause the breakdown of your entire water heater and void your warranty. 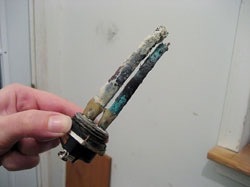 A burned out heating element can occur. Keeping your water heater clean can help the system work better, increasing the efficiency and longevity of your system. This all leads to lower utility bills. 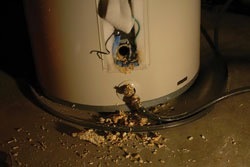 Avoid a water heater replacement and keep your water heater in top working condition. Water heater maintenance can be the difference between a six-year lifespan and a ten-year lifespan. What Happens When a Contractor Flushes My Water Heater? A service technician attaches a hose to your water heater tank, empties it into a drain, and then fills the tank back up with water. In most cases they will clean and inspect rods, ventilation and other important parts. Schedule regular water heater maintenance with Heat Relief by filling out our schedule service form. For more on this or any of our other products and services contact us today.